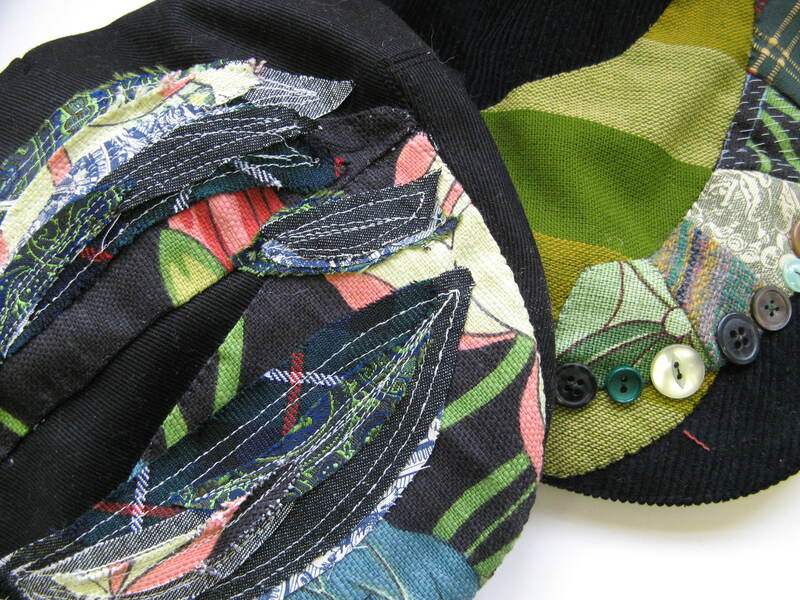 My Jaunty Jim caps are quite a new venture for me, something I began last November when I was asked by one of my stockists to make some gifts suitable for a man. I really enjoy doing them as they prove quite a contrast to my Agnes and Cora accessories- a much more rugged and robust style of sewing! I like contrasting neatly hand-appliqued panels with raggedy `patches` made from layers of rough edged toning fabrics with lots of scribbly machine stitching visible. 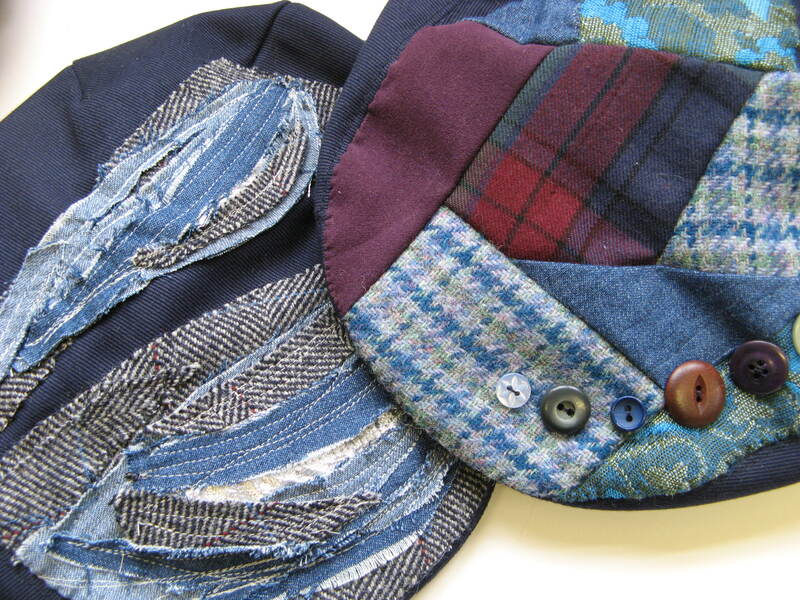 The fabric is 100% recycled, using scraps of tartans and tweeds and pieces from old ties. For Spring, I have also been using linens and toiles from furnishing fabric samples. 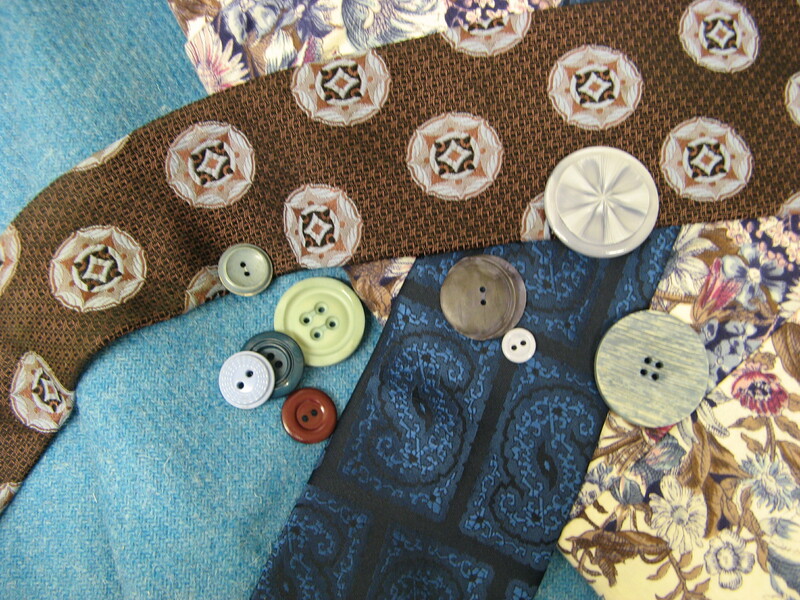 Some caps are also finished with a scattering of vintage buttons. 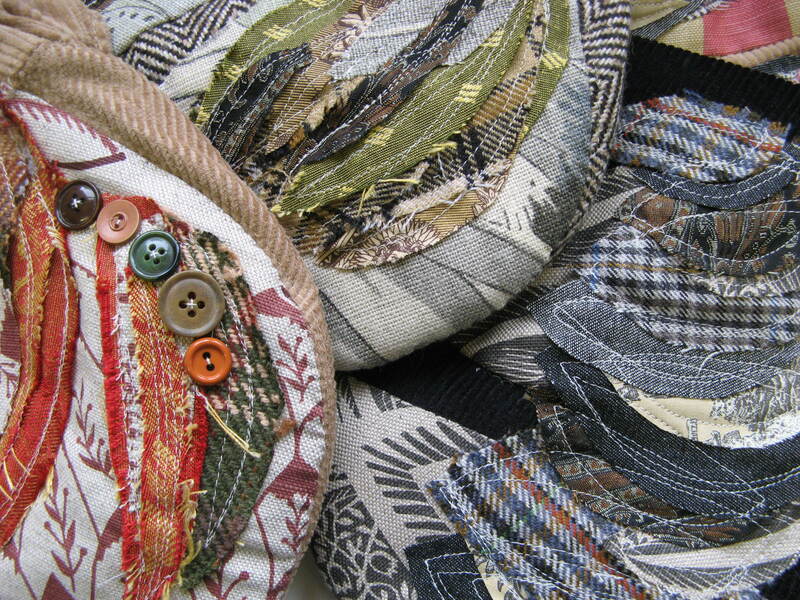 A new selection of Jaunty Jim caps will soon be winging their way to Verve in Rose Street, Edinburgh and Flux in Leith. They are perfect gifts for that special man as each cap is unique. I may be biased, but I think every guy looks good in a cap! Jim (Jimmy) was my grandad`s name (husband to Agnes!). He wore a jaunty cap every day so I thought it was fitting that I called my label after him! 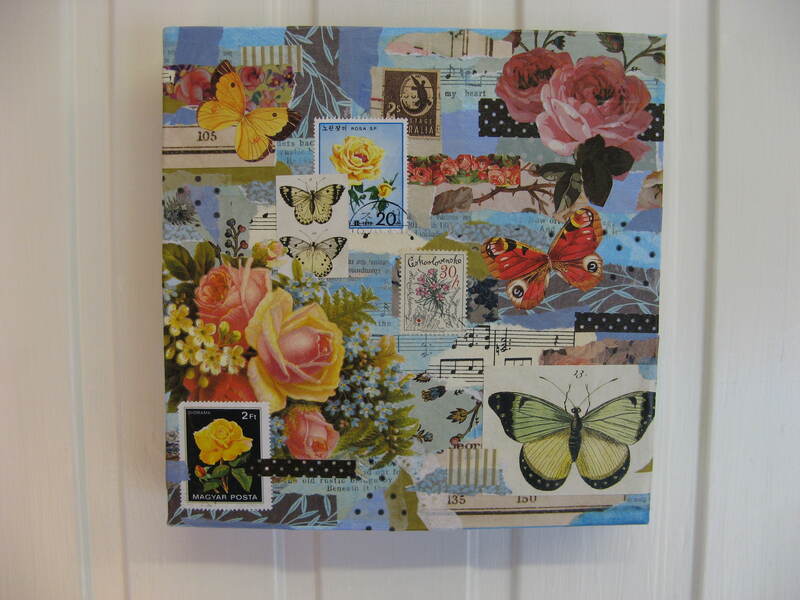 These decoupage brooches are new to my range and I`ve really enjoyed making them. 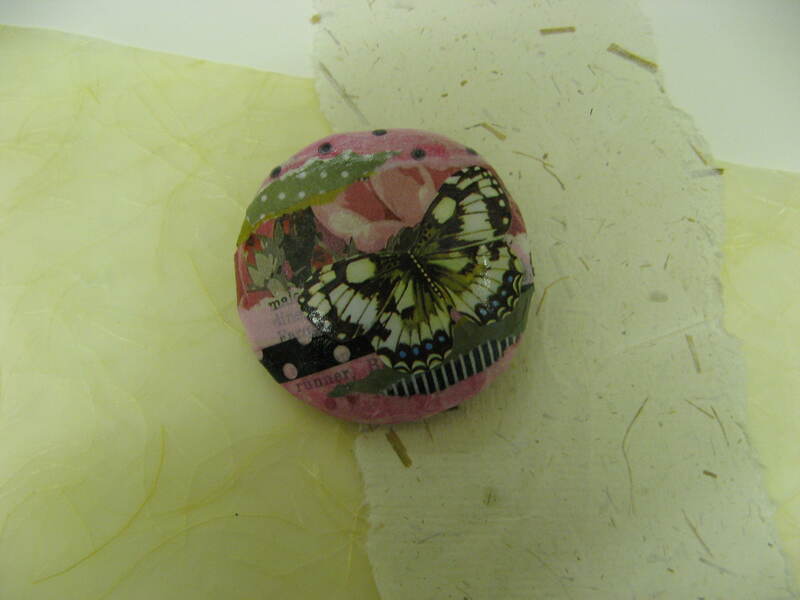 I used to make papier mache vases and bowls many moons ago and it`s great to be playing around with papers again, though on a much tinier scale. 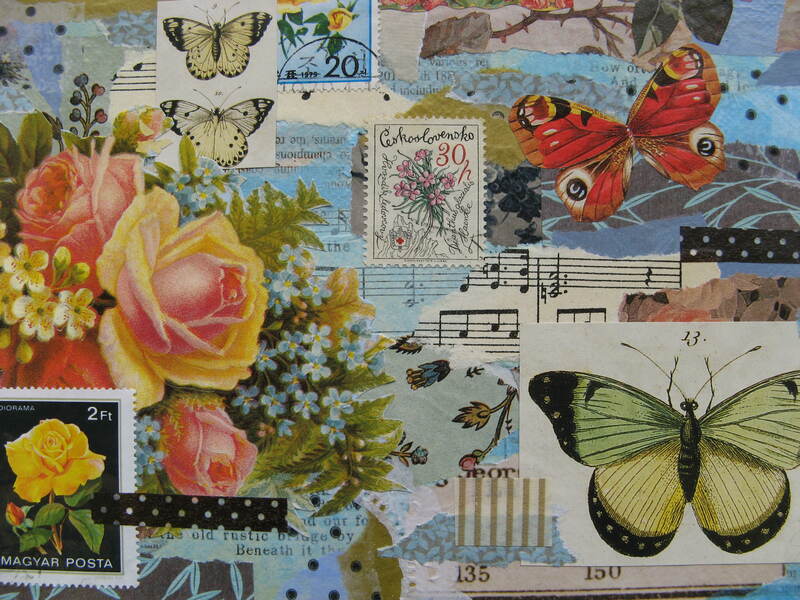 I`m starting a new collection of papers, keeping interesting scraps of colours and patterns from magazines and gift wrap. I already have a folder full! 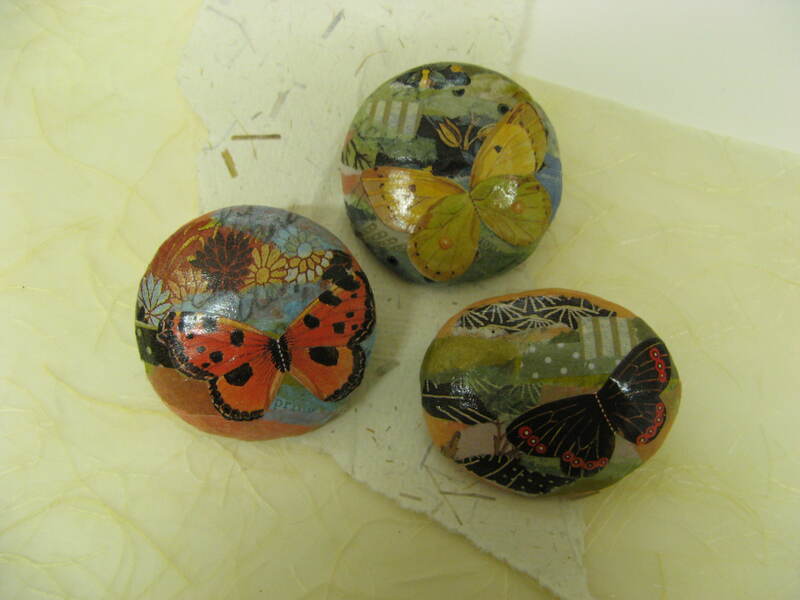 I`m really pleased with the way the brooches have turned out, the gloss varnish has transformed them into shiny, bright little pebbles. 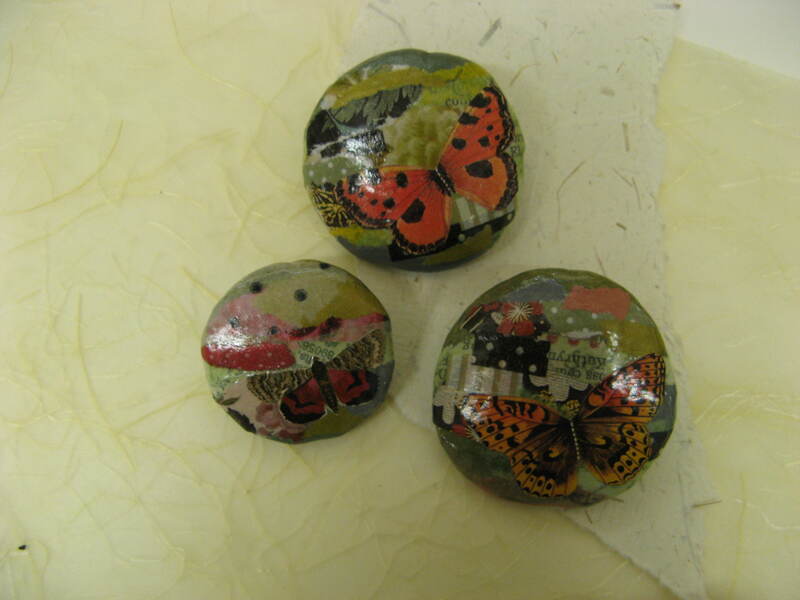 I`ve already started on a second batch and have been experimenting with making decoupage beads in the same style. 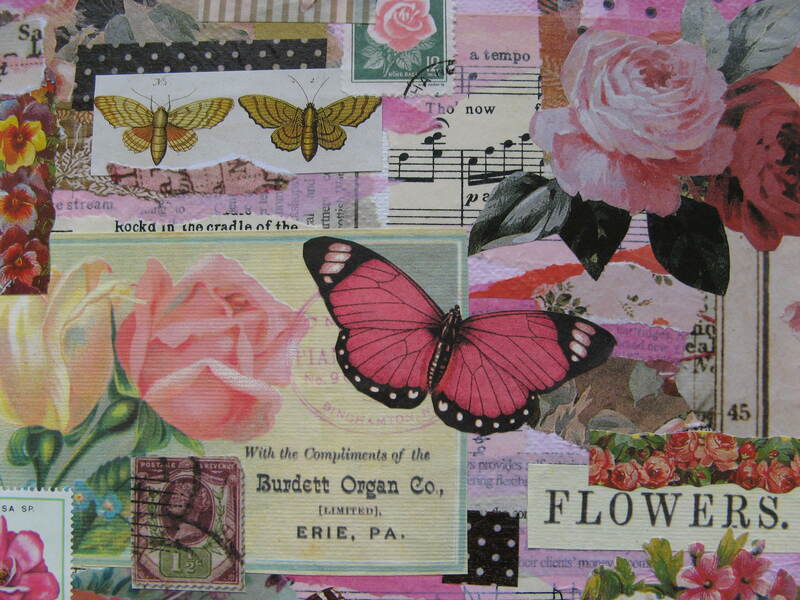 It`s so much fun starting a new project! My first batch of butterfly brooches are already available in all my stockists. 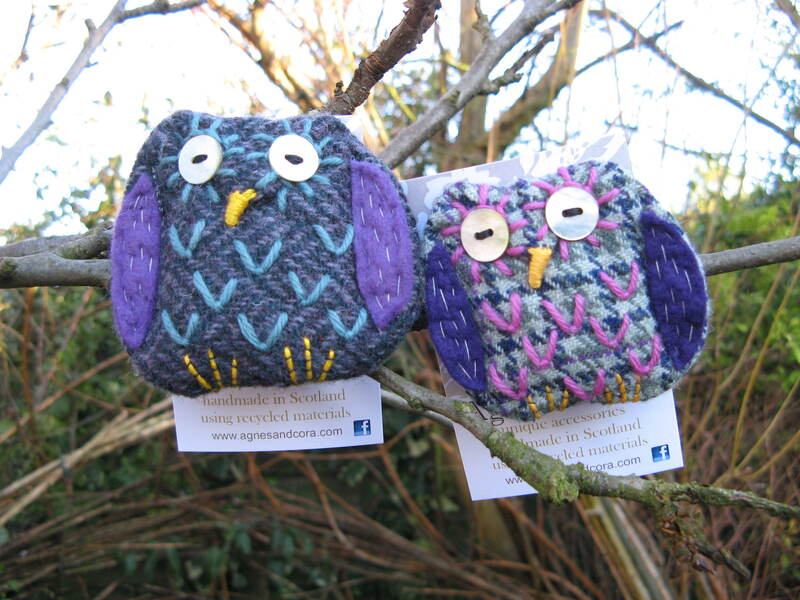 Here are this week`s owls. I thought they looked quite sweet perched in my apple tree. 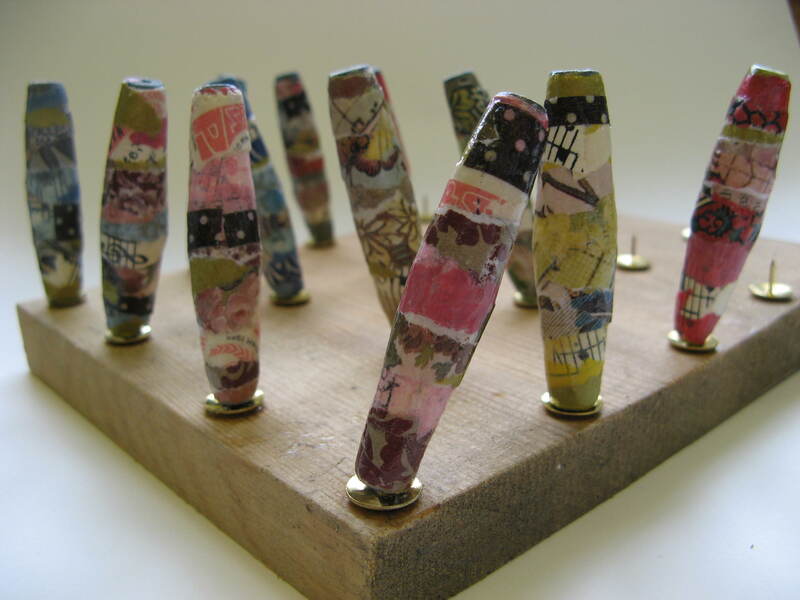 They are made from recycled tweed with felt wings and blanket- stitched feathers. I love embroidering their beaks and little claws. 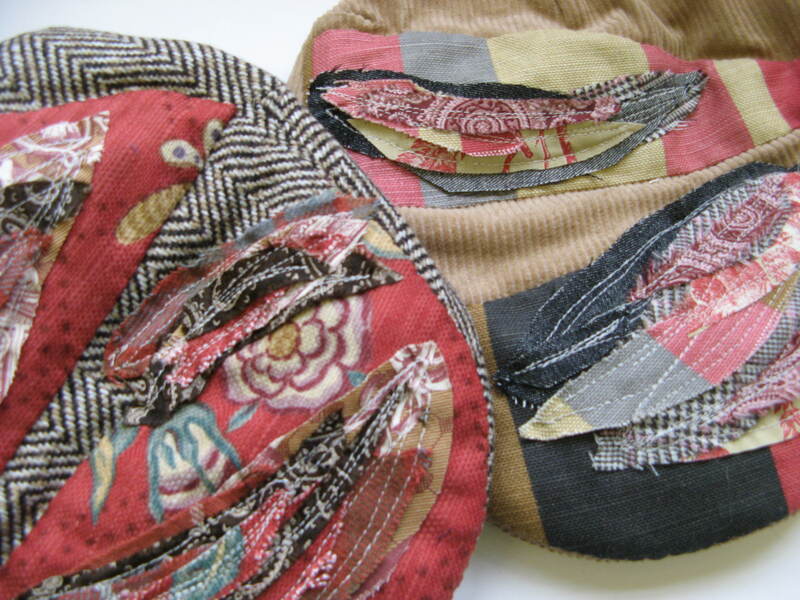 Their shell button eyes are also recycled from some button-covered cushions; a lucky find in my favourite charity shop! 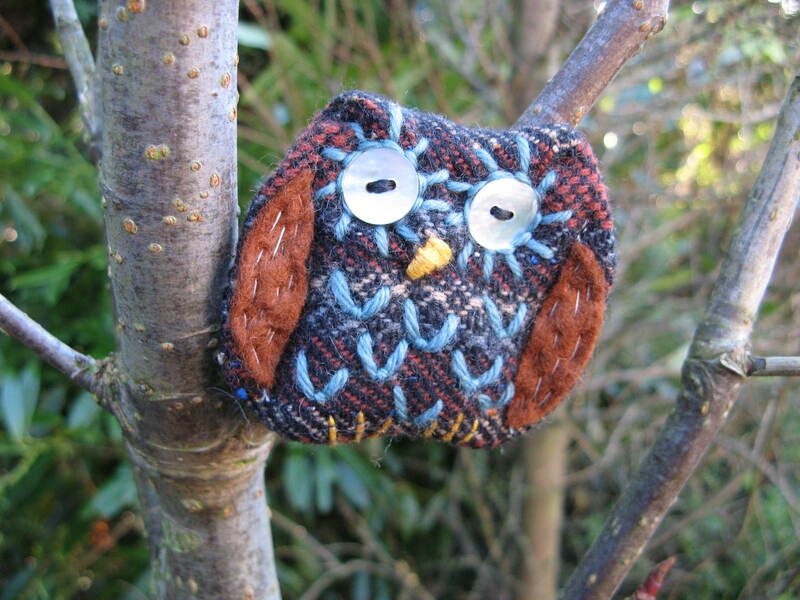 My little owls are probably still my favourite brooches to make- no two are alike and I`m never quite sure how they`re going to turn out. They seem to take on their own wee personalities as they are being made. What treasure! Here are some of my charity shop finds this week. I really love the gorgeous turquoise wool tweed, almost a two metre length. I love a bargain and so it has always been natural to me to hunt for fabric in charity shops and jumble sales and recycle old clothes rather than buy new fabric off the roll. Nothing beats a good old rummage and unearthing an old jacket or skirt in gorgeous fabric.The jackpot for me at the moment is finding a 1970`s tweed or tartan maxi skirt, preferably in the largest size possible (more fabric!). I`m also using old ties in my work a lot just now. 1970`s kipper ties are best (again, more fabric) especially paisley patterns. 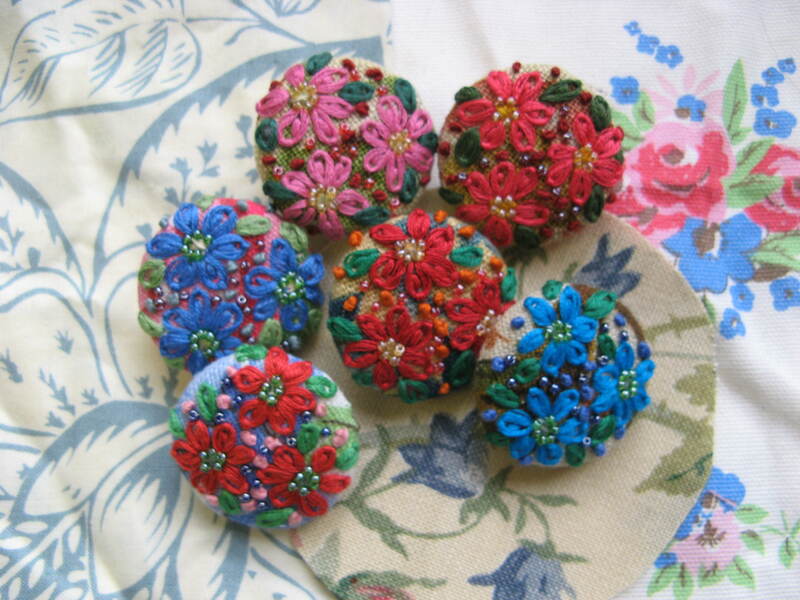 Even quite psycadelic colour combinations can look great as a little covered button on a tweed brooch or fascinator. I also love finding scraps of old crocheted lace or embroidered tray cloths. 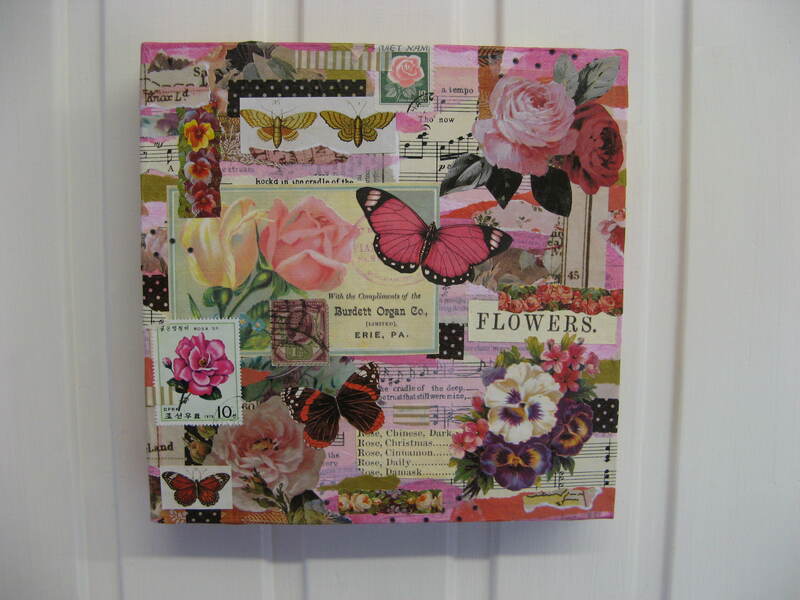 If they are a bit stained I don`t feel too bad about cutting them up and reusing them! Absolutely nothing gets wasted in my workroom. I keep every scrap of fabric; even the tiniest piece of tweed can be used to cover a button or perhaps make a quilted leaf for a corsage. 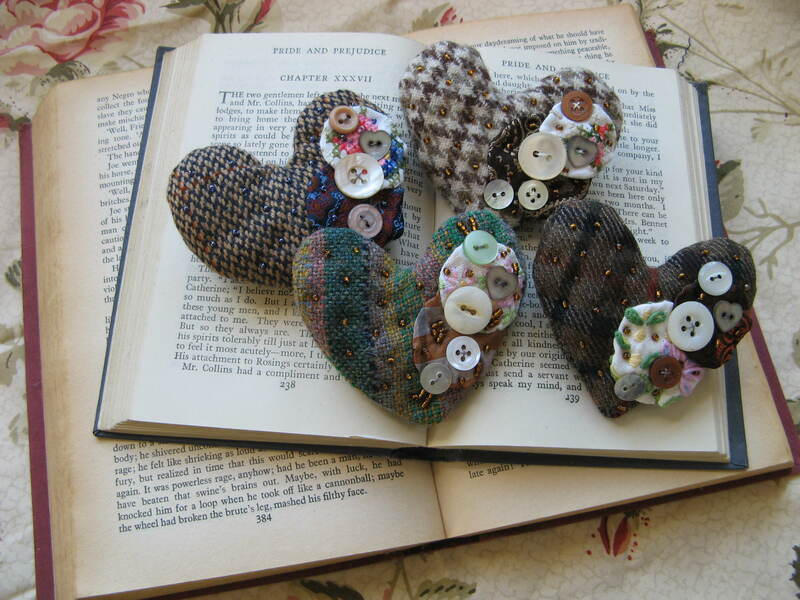 These sweet little heart brooches are new to my collection. 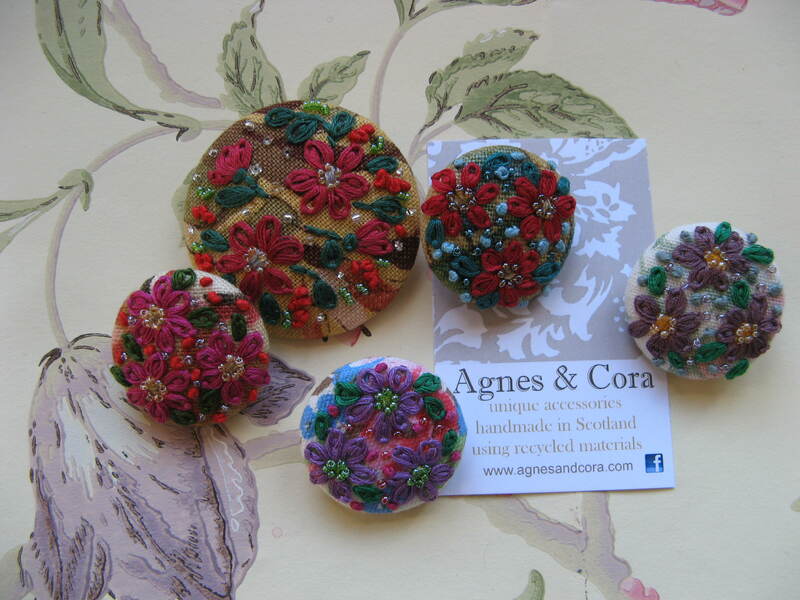 They are made from recycled tweed and scraps of fabric from old ties and embroidered tray cloths, then embellished with vintage buttons and tiny sead beads. They are currently available in Miss Katie Cupcake and Flux, and I hope to have a small selection in all my stockists in time for Valentine`s day.